Below you will find our Address and Phone Number, our Opening hours, an outline of what the gallery looks like and information about how to find us. The gallery is open Tuesday to Saturday between 12 and 4pm when there is an exhibition on. Between exhibitions it is closed. Please check "What's On" or phone to make sure we are open before you set off. The gallery is run by volunteers and, unfortunately, we can't open outside of these hours. What Does the Gallery Look Like? The building houses two galleries which we have called the Picture Gallery and the Sculpture Gallery. In practice both can be used for sculpture and paintings. However the Sculpture Gallery is much bigger than the Picture Gallery and thus more suitable for larger works. At the beginning of 2007 we moved into our new premises at 32 Seel Street. For the launch we had an exhibition with major works by artists and sculptors such as Arthur Dooley, Brian Burgess, James Cliffe, Adrian Henri, Don McKinley, Tom Murphy, James Heritage, George Jardine, Carl Hodgson, Frank Hendry etc. We had a video made of the opening which you can see by clicking on the image on the left.As well as showing you see what the gallery looks lik the video also contains brief interviews with our director June Lornie and some of the artists which illustrate the principles on which the gallery is founded. Below are some pictures taken from the exhibition which also give a good idea of the size and appearance of the galleries. Just click on the images to see them full size in our viewer. This has two sections The long front section which is shown in the two pictures below. And a second rear portion which is separated fron the front by a short dividing wall. This shows the front of the Picture Gallery. The main entrance to the street is to the left whilst on the right right you can see the counter and the side of the offices. This shows the rear part of the Picture Gallery. The picture was taken from the main entrance. To the left you can see the entrace tro the Sculpture gallery. This is big open space suitable for large works. The two pictures below, taken whilst setting up our opening exhibition in 2007, give a good idea of the size. This is the view you get when you go through from the Picture Gallery into the Sculpture gallery. Another good view of the Sculpture Gallery. Below are a link to Mutimap and instructions to help you find us by train or car. 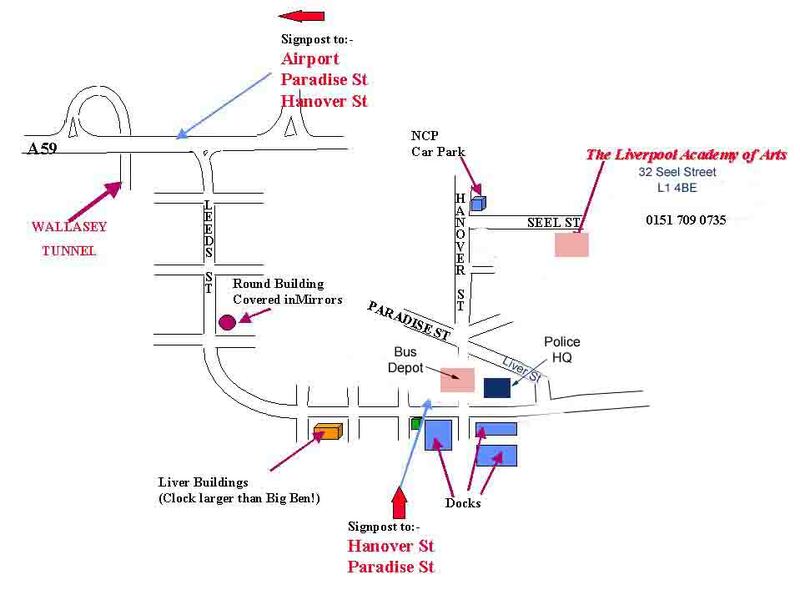 Once you get near to the city centre, the map of Liverpool Town Centre should help you find your way to our door. Just click on Link to Multimap to connect to Multimap and use them to get directions. You will need our postcode, which is L1 4BE. One word of warning - The routes given by Multimap or by a satellite navigation system may not be totally correct due to the many changes which are taking place in the city centre. Take the Merseyrail train to Central Station. Come out of the main entrance and turn left down the hill for thirty yards where you cross over the bottom of Bold Street and turn left onto Hanover Street. (There is a branch of HSBC on the corner). Seel Street is the third on the left and you will find the gallery about 200 yard on the right. Take the mainline train to Liverpool Lime Street. Come out of the entrance just opposite Platform 9 bringing you out onto Lime Street . Turn left and go along Lime Street for about four hundred yards until you see the Adelphi hotel on your left and Lewis's department store in front of you ( with a large naked male statue over the main door). Turn right down the hill for about 100 yards and you will cross over the bottom of Bold Street . Then turn left onto Hanover Street. (There is a branch of HSBC on the corner). Seel Street is the third on the left and you will find the gallery about 200 yard on the right. (1) Follow the M6. Take Junction 26 onto the M58. At the end of the M58 follow the A59 to the centre of Liverpool. Pass the slip road to the Wallasey tunnel and keep to the right hand lane to turn right at the next lights (onto Leeds Street) towards the pier head and the Liver Buildings. See map. (2) Pass the Liver Buildings on your right and after a few hundred yards you will see the docks on your right and the Bus Depot on your left. Keep going past the Bus Depot and then at the next set of lights turn left into Liver Street. About 200 yards up Seel Street, on your right, you will find No 32 which houses The Liverpool Academy of Arts. Follow the M6 and turn left onto the M62 at junction 21A onto the M62. Follow the signs to the Wallasey and Birkenhead Tunnels. At the bottom of a hill traffic turns left to the Birkenhead tunnel and right to the Wallasey tunnel. Turn right as if to go to Wallasey, but keep to your left and turn left at the next set of traffic lights (onto Leeds Street). Follow the directions from (2) above. Turn off the M56 at junction 12 and follow the signs to Runcorn and Liverpool. Over the Runcorn bridge and keep to the right to take the road to Liverpool along the A561. This, after several miles brings you out with the Albert Dock on your left and the Liver Buildings in front. Turn right into Liver Street (Signposted for (???????) and follow directions as at (3) above. Get onto the M62 and when you come off into Liverpool follow the signs to the city centre.